2015 Dhanu Rashi forecasts a difficult first half of year 2015. Situation will see improvement gradually. You have to put in more hard work to accomplish things. Saturn is beginning his unfavorable aspect. So natives of the Dhanus Rashi need to get ready for its effects from now on. Second half of the year will be beneficial in all respects, predicts the Dhanu Rashifal 2015. It is necessary to keep away from legal tangles. The career horoscope 2015 Sagittarius zodiac sign foresees lot of stress at the work place. Change of location for professional purposes is likely. During second half of the year, students will achieve academic excellence. 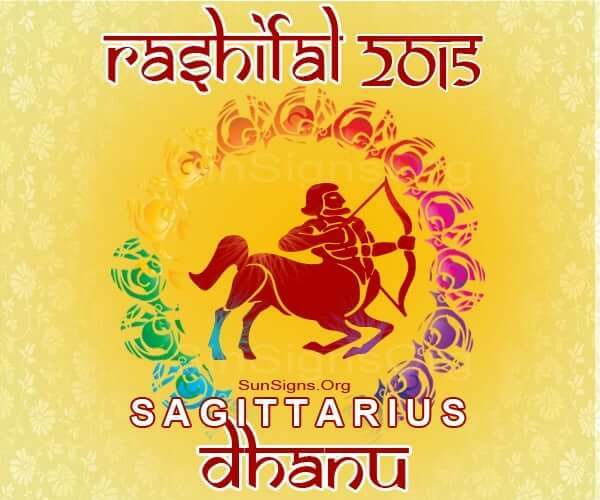 The Dhanus Rasifal 2015 for financial astrology predictions points to a challenging year. Expenditure will be more than income. More effort is required to generate enough resources. Because finance is affected, it will have a bearing on all other things. 2015 Dhanus Rasi yearly predictions show that, 2015 is not ideal for people to seek new romantic partners. Singles might have flings but nothing more. Married couples might have trouble in understanding their partners. Be patient if you want your love life to improve. Family relationships will not be pleasant and you will have a feeling that relationships have changed for the worse. There is a sense of insecurity. Health of parents will cause some anxiety. There may be difference of opinion with parents and elder members of family. The 2015 Bhavishya Rashi for Dhanu Rasi shows that health will be tricky during the year. Strict control over diet and exercise is required. People suffering from diabetes have to be extremely careful. Dhanu Rashi 2015 predictions for travel suggest that it is best avoided this year. Vacations with loved ones can take your mind off negative things.